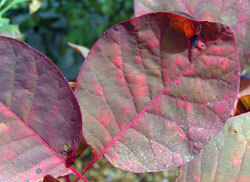 The smoke tree is realy a BUSH with a stunning foliage show. Leaves turn dramatic colors in the fall. Small spring blooms become "puffs" that look like a hazy smoke haloing the tree. Some varieties do not bloom as freely in our cooler climate, but that can be affected by your microclimate as well (warm wall location may negate that comment). Deciduous through winter and low water needs after establishment. But this author has noticed that it really requires summer water in sandy soil to ride through the dry times. Also, smoke trees do not like prevailing wind and will drop leaves if subjected to such. 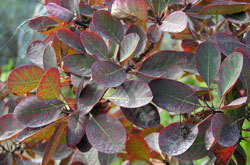 This small tree can be grown as a multi-trunked shrub or single trunk tree. Multi-trunk form is generally preferred and more interesting in a landscape. There are several foliage varieties available - some showier than others. "Grace"—a hybrid between C. coggygria and C. obovatus—has a beautiful fall display with colors shifting from peach to orange to yellow. 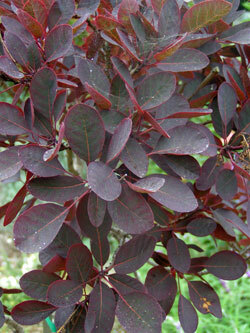 There are bluish-green leaved varieties and many reddish-purple forms. Check a specialty nursery for selections. Slow to medium growth depending on watering. Not fussy about lawn water - can be grown near lawns. *note asterisk denote species enjoys summer water in the sand. **note asterisk denote species will be shaped by a prevailing wind. This tree will do best out of the prevailing wind in a protected location. Location This tree is generally grown in backyards. No specimins known that can be seen from the street in Marina.